A substantial upgrade to the standard 214ce, in terms of appearance and sound: an excellent serious gigger's tool. Great build and spec for the price. Organic, playable neck. Lovely tones. With subtle bling from the small diamond inlays, the playability here is typically Taylor: superb! 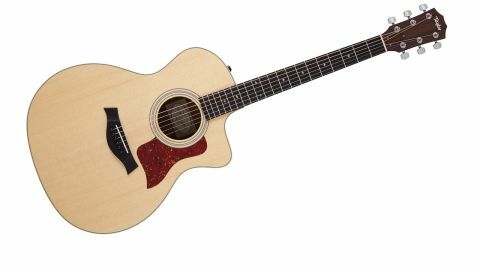 In Taylor's new 200 series we have a septet of Deluxe (DLX) models that for a modest upcharge add the sort of spec and features we'd normally get only in the start-up USA-made 300 series. Compared to the standard 214ce, our 214ce K DLX uses laminated - or 'layered' as Taylor prefers - koa, instead of the 200 series' standard layered rosewood back and sides. Irrelevant of any sound implications, koa is a highly-prized, attractive wood, and with a full-gloss finish to the body - instead of the standard gloss top/ satin back and sides - this DLX model looks a whole lot more expensive. There are subtle touches such as cream, instead of white, edge binding and small diamond pearloid inlays over the standard models' dots. But the major change that'll affect any gigging musician is the inclusion of Taylor's dual-transducer original Expression System, which has powered every Taylor guitar from the 300 series upwards for the past decade and hasn't been available on the 200s before - they've used the ES-T under-saddle system. "If you've never played a Taylor - where have you been? - this koa 214ce would be a perfect entry point"
If you've never played a Taylor - where have you been? - this koa 214ce would be a perfect entry point. And for any players who might have been put off by Taylor's almost clinical precision, again this one's worth a look. The satin neck finish is much more open-pore in feel, which lends a really organic feel to the neck. The profile is less slim than you might be led to believe, too; a hint of a V in the lower positions is really comfortable for thumb-around styles, and as you progress up the neck it rounds out a little for a fuller oval, but is not over-deep for thumb-behind lead lines. As ever, there's a slight ridge where the neck joins the fingerboard, which would invariably be sanded out on a more artisan build, but it doesn't affect playability. Setup is typically good, too - light but not overly so, and intonation is excellent: high-fret notes meld with open-string drones without any adjustment. In fact, the perfectly serviceable generic enclosed tuners were rarely used apart from for detuning. The grand auditorium is bigger than it looks, with the same length and width as Taylor's dreadnought; the difference lies in the more pinched waist that, certainly in its non-cut guise, seems like an OM that's been inflated. With its cutaway - a flat Venetian-style used on the Mexican guitars, rather than the slightly upturned cutaway of the USA models - it assumes a more classic and modern Taylor-esque appearance, even though the cutaway almost references the classic Django Reinhardt Selmer-Maccaferri design. Kinda cool. There seems to be a little more looseness than previous 200s we've played, too. Whether that's actually true is hard to quantify, but there's a give to the sound with a clean and clear tonality that's less pristine, perhaps, than some of the upper-level models. Think classic dreadnought with a bit more lower-mid definition and you'll get the idea. Taylor's Expression System has its fans and detractors, but running through our LR Baggs Venue DI into a Line 6 Stage Source it's a pretty natural reflection of the guitar's acoustic performance, certainly in lower positions. Taylor's grand auditorium is the definition of the modern electro steel-string, and this deluxe version is well aimed. With its upgraded pickup system, all-gloss exotic wood body and a hard case, while you can't call a four-figure sum a 'steal', in reality it is. It's superb.